This Scenic Area is located on the south end from Kai Bae on the tropical Island Koh Chang in Thailand. From the View Point there is a beautiful view over the Sea. The sunsets are amazing from here. 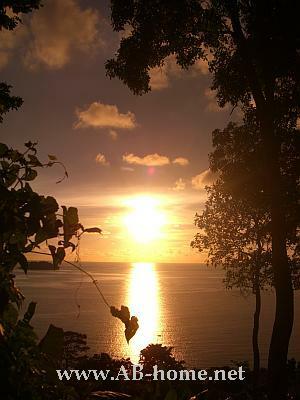 The sun goes down behind some small Island which belongs to the Mu Koh Chang National Park. The Islands like Koh Yuak which you will see from here are all uninhabited. On the Scenic Area in Kai Bae Beach are public Toilets and sometimes some Thai Food stands where you can buy some snacks. The easiest way to reach this View Point on Koh Chang is by Motorbike wich you can rent nearly everywhere at Kai Bae Beach in Thailand. The price for one day is about 200 Thai Baht excluded Gasoline. If you want to do some exercises, no problem! It’s just a 10 minutes walk from south Kai Bae Beach. Just follow the Mainroad and don’t forget the usual stuff which you need everywhere in Thailand: Suncreme, Drinking Water and Mosquito Spray. The fee for the view point is free. Enjoy the romantic Sunsets of Koh Chang from this view point, it’s one of the nicest places to do that on the Tropical Island in Thailand.